Portuguese chartographer; flourished in Palestine (Wolf, "Bibl. Hebr." i., No. 1097) in the first half of the seventeenth century. He was the author of a chart of Palestine, written in Portuguese under the title "Relação do Citio de Terra de Israel" but published in Latin (Amsterdam, 1631 [Bartolocci: 1621]). It was accompanied with a number of historical data concerning the places noted in the map. Shabbethai Bass ("Sifte Yeshenim," מ, No. 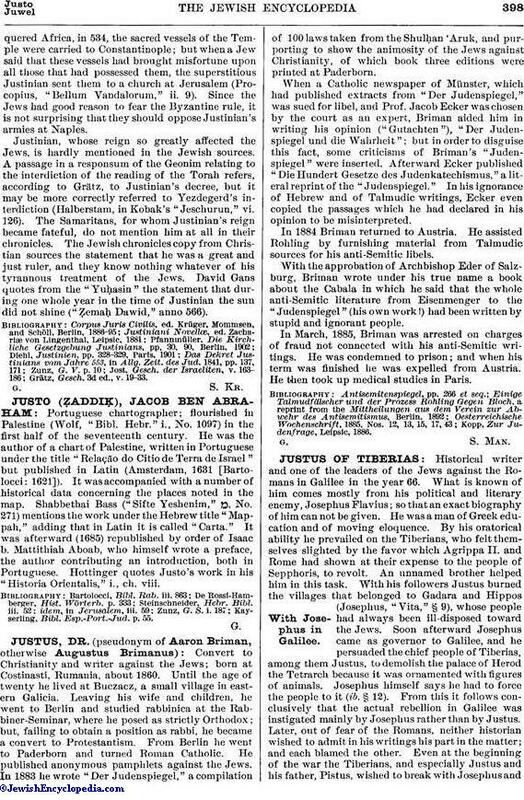 271) mentions the work under the Hebrew title "Mappah," adding that in Latin it is called "Carta." It was afterward (1685) republished by order of Isaac b. Mattithiah Aboab, who himself wrote a preface, the author contributing an introduction, both in Portuguese. Hottinger quotes Justo's work in his "Historia Orientalis," i., ch. viii. Kayserling, Bibl. Esp.-Port.-Jud. p. 55.